Hosts Dave Jorgenson and Cheryl Macarthy have designed a restaurant, a menu and a mood that is relaxing, friendly, and exceptional. Over the years we’ve evolved our selection. In 2010 we’re expanding again. We’re introducing a wide variety of cool and unique gifts that reflect our themes of food, the outdoors, and music. In addition, we’re introducing more Organic Foods, and containers, Frog-Friendly Coffee, and are now completely Green Energy Powered through an electrical agreement with BullFrog Power. 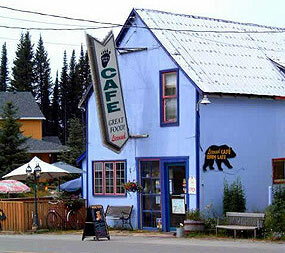 In addition to providing food that is exceptional in its quality, presentation, and taste, the Cafe is also alive with music events, has a great gift item selection, and features an outdoor theme consistent with its setting in a once booming gold mining town, deep in the Cariboo wilderness. We are the source for information about the region, its people and its events. Our expansive, licensed patio provides beautiful outdoor seating. The Bear’s Paw is more than a dinner cafe . . . It’s an experience.